Both of my girls wanted to make a handmade Christmas gift for their cousins and a few friends. 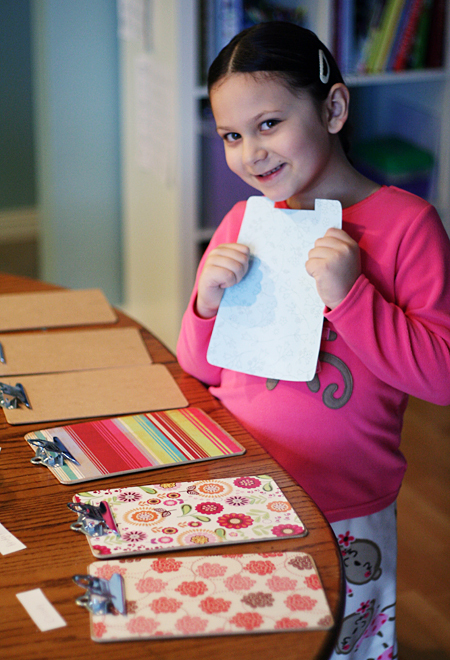 Delaney settled on decorating mini clipboards with scrapbook paper, letter stickers, felt, and buttons. I’m sure you have seen decoupaged clipboards, journals, etc. before – so simple, with endless ways to personalize! I made a template of the clipboard shape, which Delaney traced onto the back of her chosen papers. We cut them out and glued them to the clipboards with Mod Podge. After they dried for a bit, we added each person’s initial with a letter sticker or cutout. Then, the whole thing got a layer of Mod Podge over the top. We covered the logo on the clip with a felt circle and a button (hot glued on). Add a notepad and glittery pencil and you’re done! We even tied our pencils to the clipboards with rainbow ribbon. In one morning, we were able to make 8 of these start to finish. Simple, affordable, and useful! I hope our cousins and friends have a great time writing and sketching on their new clipboards! We found ours at Staples – hope that helps! Staples has the bigger clipboards for only $1.00! That’s where I got mine for this project. 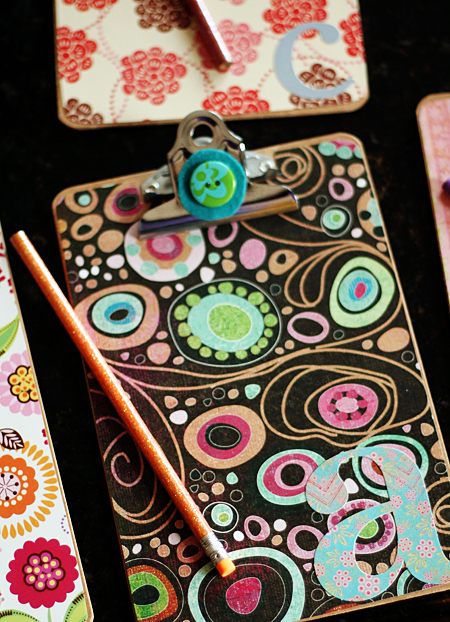 Gorgeous papers and embellishments to an ordinary object! Well done. Absolutely LOVE THESE! Have loads of nieces and nephews who will be getting these as pressies this year!! This is the cutest idea, and it look simple enough for the kids to do. Thanks for the great idea. We are going to do them to pur in my daughters birthday goodie bags. Thanks again. Love this idea! Thanks for the post, also using them as party favors for my daughters “go green” party. Found the clipboards at staples for about $1.39/piece, made of recycled wood too. Great inspiration and useful as well! Is there a secret to getting the paper on smoothly? I am doing full sized clipboards and having difficulty getting the paper to go on smoothly. I have had the best luck with using a thin layer of Mod Podge to attach the paper. Smooth it really well, and go back and smooth it a few more times as it dries. Let it dry completely before trying to put the coat of Mod Podge on the top to seal. Also, thicker-weight scrapbooking paper tends to work better and have less bubbles than thinner paper. Man…tried this with large clipboards and I had a heck of a time with bubbles after putting on the top coat of Mod Podge. It totally ruined them. I then used spray adhesive and then put clear contact over the top. Not nearly as cute, but I had to get it done for Christmas gifts. Any insight into why I had all the bubbles?? Hi Amy! I’m not sure if you had a download-able template available for this project? I had thought there was one last time I looked at this page. Just wondering if my memory is going, or if I just can’t find the link. I was hoping to make some for Valentine’s gifts. Thanks so much for the idea! Those are absolutely adorable! will have to make them for my little girl and her cousins. You can often find clip boards at thrift store for 50 cents. I tried to make one but the papers you buy are only 12×12 and the clipboards are 12 1/2″. Did you piece them or how did you get one sheet to cover the entire clipboard? 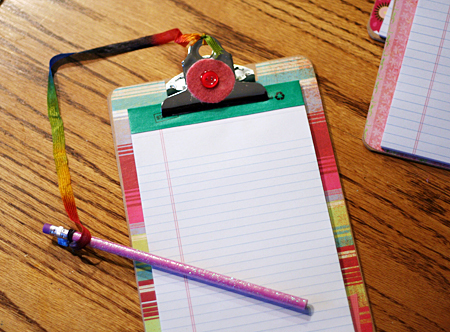 We made ours with mini clipboards, not full-size clipboards. For a large clipboard like that, I would piece together a couple coordinating papers. I have made these for my daughter’s girl scout leaders. One suggestion is to do the back too. Once you have something on the clipboard you can’t see the cute paper. Hi! I’ve tried making these but once I’ve fully completed the project and it’s fully dried, things stick to the clip board. The other day I set some note paper on it and it ripped off leaving some of the note paper behind on the clip board. Any ideas on how to solve this? Thank you! Hi Cammie – Hmm…I’m not sure how to fix that! I haven’t had anything stick to mine yet. I usually stick a notepad in mine, so maybe the cardboard back is less likely to stick than paper? Wish I could be of more help! 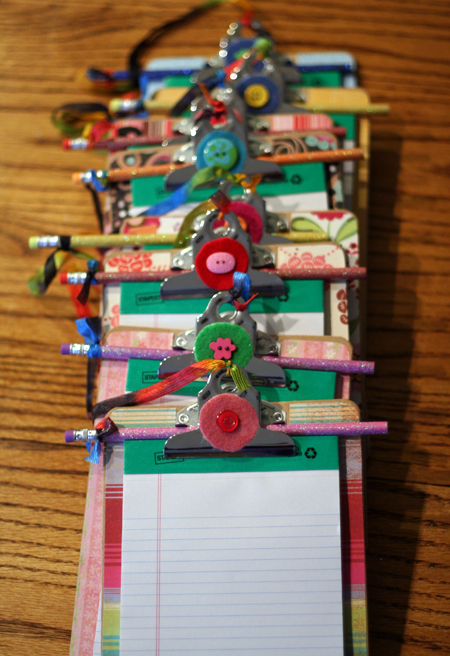 Great idea for Christmas gifts for your favorite teacher!! !